The point of this review is to focus on the Earthwise LCS35814 14” cordless chainsaw. I’ll be providing an in-depth review of how the product feels, performs, and its features. While I’m at it, I’ll also review the WEN 40417 16″ cordless chainsaw, since it’s a comparable alternative to the Earthwise. As you’ll see, the WEN is more of a bargain, but has slightly different features and characteristics. I know what you’re already asking – Is the Earthwise LCS35814 a better chainsaw than the WEN 40417 alternative? Realistically, yes, but don’t forget that you’re paying more for a chainsaw that is more compact. But don’t jump to conclusions. Try reading the reviews of these chainsaws and make your own decision. 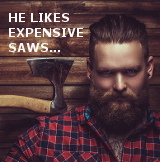 Everyone considers or calculates value a different way, and some folks will simply refuse to pay more for a smaller chainsaw. There is a legit decision to make here – whether the Earthwise chainsaw is a higher quality product, and whether that alone is enough to justify the higher price. You’ll notice a fantastic warranty offered on the Earthwise LCS35814, which suggests they are quite confident their saw is durable enough to outlast most other cordless chainsaws. As I mentioned before, It think it’s best if I talk briefly about the Earthwise brand before we jump into the review. In researching this, the heritage behind the Earthwise name has given me more of a warm-fuzzy feeling, even though I had not heard of it before. Even if you haven’t heard of the Earthwise brand, I’m sure you’ve heard of the American Lawnmower Company. It’s a company that’s been around for decades manufacturing dependable outdoor power equipment. It has a long history of consumer acceptance. The American Lawnmower Company was started back in 1895. Like others in that time, they got their start making reel mowers. Of course the world has changed, and equipment using ICE (internal combustion engines) is being replaced by cordless, battery power. Back then, you could buy one of their lawnmowers for around $3.00. A top of the line model might cost $5. Of course you had to power the thing with your legs! Over time, the company of course started making gas-powered mowers, along with other equipment. As technology changed, and consumer sentiments changed, they started developing electric garden tools to do basically any outdoor task. No company sticks around for more than 120 years unless they keep up with what their customers want, and keep up with laws, regulations, and technology. As folks have become “greener”, and more concerned about the environment, the Amercian Lawnmower Company evolved its product line. As they have electrified their product lines, it gave birth to their newest brand Earthwise, an obvious play for the green/environmental side of things. In the last 10-15 years, the American Lawnmower company used their Earthwise branded products to satisfy the electric OPE space. They typically design their products to be as energy-efficient as possible, while at the same time trying to balance the power demands of discerning customers. This isn’t easy to do, but when you read over the reviews of their product, I think it’s something they’ve been able to balance well. Some Earthwise products are corded, some are cordless. Regardless, they typically use brushless motors to improve efficiency and reduce power demands. These brushless motors also last longer, and require basically no maintenance for the life of the product. That type of modern technology gets backed into their products, and seems to do well once it finds its way into consumer’s hands. The LCS35814 14” 58-Volt cordless chainsaw is one of Earthwise’s top models for this brand. It’s not unusual to find other cordless chainsaws with a 16” bar and chain on their top models, we shouldn’t fall into the trap of making this our top priority. 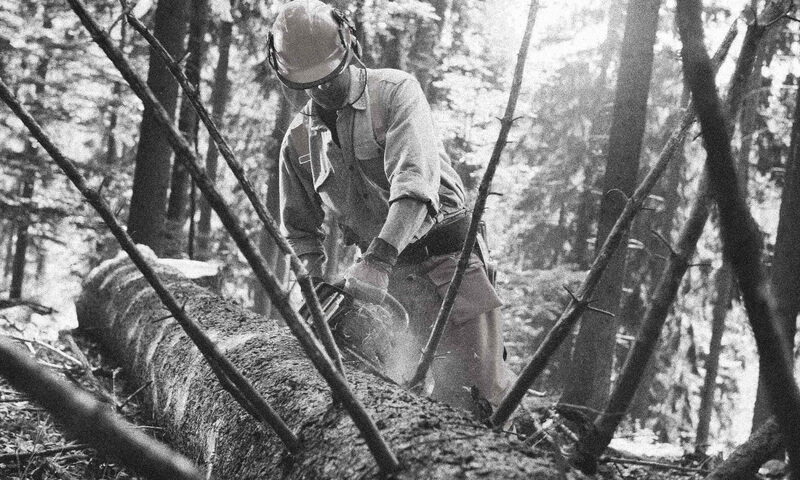 An extra two inches of bar length can be an advantage if cutting thick logs, but it isn’t all that we need to consider. What’s evident with the Earthwise LCS35814 is the company has put all their effort in making this their halo chainsaw. With respect to power, it can match most gas-powered chainsaws in the same size range, and that’s what counts. Even if a saw has a longer bar, without the power to match it, you’ve gained nothing useful. When the going gets tough, and you’re cutting harder woods, that point is even more important. Extra power means less laboring and straining, both for the saw’s motor and your back! So this should be our number one consideration. If you intend using your chainsaw for hardwoods, the Earthwise LCS35814 is probably going to be, in my opinion, one of the best cordless chainsaws for the job. Another reason I give the Earthwise LCS35814 extra stars attention to detail and the level of quality built into the saw. Yes, it’s on the higher end of the price range, but it’s apparent given the excellent fit/feel/finish that Earthwise has spent extra time and money on the details, making it as appealing and durable as they could. The included 5-year warranty is, as far as I can remember, one of the best I’ve seen in the industry. That says a lot about how confident they are about their product, and how far they will go to stand behind it. That speaks volumes to me. In using the the Earthwise LCS35814, I get the impression it was designed with quality and durability in mind. All of the plastic covers, buttons, and handles feel very tough and impact-resistant. The motor housing and some of the knobs say “Lexus” to me rather than “cheap”. Other bits are metal, and the parts seem to flow very nicely together. The bar, bar housing, and chain sprocket are made of what appears to be very thick, tough metal, no doubt with an eye towards durability. In use, the saw feels nicely balanced. As I mentioned before, the grip is premium and fits the hand well. It feels tough and solid. At 15 pounds, this is no featherweight saw, but it feels solid and powerful, with minimal vibration and kickback. The Oregon bar and chain are probably where Earthwise spent a bit of their money, and it shows in how hungrily this saw devours wood. Some of the best saws in the industry use this type of bar and chain, and clearly Earthwise had no intentions of scrimping with their pennies. Their automatic chain oiling system means the chain is self-lubricating, which is a really nice feature. Not only does this improve the durability of the chain, it keeps cutting operations more efficient, meaning your battery lasts longer and you have more power available. The chain tensioning system is wonderful, with a large knob that falls easily to hand, even with gloves on. Some manufacturers claim “tool-free”, but by the time you get a sweaty hand in a glove it becomes very difficult to make an adjustment on the fly. The powerful brushless motor is clearly at home here, making cutting seem almost effortless in some cases. The 58V 2AH lithium-ion battery clicks solidly into place, and seems built to take some abuse. Hopefully you don’t drop it, but in the event you do, it looks like they have reinforced the battery casing to keep it from giving up the ghost. Also, the battery has a very clear one-touch button for activating an LED display to show you how much charge is left. There’s really no single, standardized way for listing a working time for a cordless chainsaw. 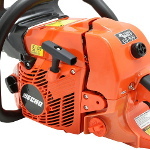 It’s difficult for any battery-powered tool, but chainsaws in particular have so many different variables to consider like speed of cut, how hard the wood is, how sharp the chain is, running rpm, etc…. it’s a tough call. As you become more proficient, you will actually be able to work the saw more efficiently, and extend your run time. Under normal working conditions, you will probably get around 30 minutes of runtime. Now, “normal working conditions” means something different to just about everybody. If you are going to use any kind of cordless chainsaw heavily, you will want to get a second battery. It’s very difficult to find charger specs for this saw. You can assume around 45-60 minutes to recharge. Yes, you can plan your activities and usage around having one battery if you want. Saw for 30 minutes, get the battery charging, and then move your wood. Depending on what you’re doing, you may take longer to stage the wood and move it where you want it than the battery takes to recharge. Sawing wood for 30 minutes, if you’re not used to it, will tire you out. Most homeowners probably won’t need more than a 30 minute saw. Do not use full power if it’s not needed. Adjust your trigger pull to deliver the amount of power that’s required, conserving battery life. The soft-grip handles feel incredible and eliminate a good bit of vibration. Despite the comfort, you’ll want to work with gloves on anyway. The handles offer plenty of gripping positions with a standard wrap-around design for the front handle. The chain guard that doubles up as a chain brake is plenty big and usable. It’s in the right position, offering excellent protection. For its price point, the Earthwise LCS35814 offers solid performance and quality. No, it’s not the cheapest saw, but it’s one of the nicer ones out there. To keep competition at bay, chainsaw manufacturers rarely publish specs on their motor capacities or the charger capacities. So in that way, it’s hard for me to show you on paper that this saw beats another one. But if you try it, like I did, I think you’ll come away impressed. Not only does it seem to have a leg up in the power department, I think the Earthwise LCS35814 is also one of the more durably battery saws available. 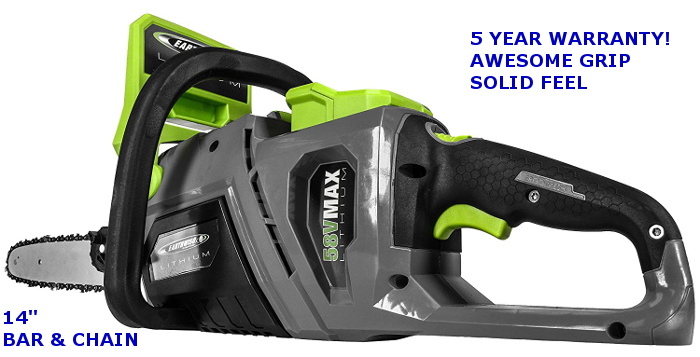 Although the 5-year warranty only applies to the saw, and not the battery and charger, it’s still one of the surest signs that the manufacturer is standing behind their product. When it comes to producing affordable tools for the average homeowner, few brands are more recognizable these days as WEN. Partly because few brands are as frequently advertised! The WEN 40417 40V Max is a great cordless chainsaw for the homeowner wanting to cut medium-sized firewood and to do the occasional garden clearing job. Realistically, it shouldn’t be placed in the same class as the more industrial-grade machines on the market. The Earthwise LCS35814 is probably a better bet if you tend more toward heavy-duty work, and it will probably fare better on hardwoods. The 16″ bar available on the WEN probably only because an advantage if you are going to be using it to cut through thick pieces of relatively soft wood. That isn’t meant to make it sound like this isn’t a good saw. It is, and probably fits consumers shopping at lower price points well. It is a quality saw that is offered with a reasonable warranty, and should last. WEN combines their brushless motor with their 40V lithium-ion battery. At 4 Ah, this is nothing to sneeze at. Runtime should be equivalent to the Earthwise LCS35814, if not better. In the hands, the WEN 40417 feels light, and it weighs only 12 pounds. But in use, the 16″ bar combined with the light weight makes it feel slightly un-sturdy. Or I guess I should say less sturdy than the Earthwise. Again, this isn’t a condemnation, the WEN is less expensive and it’s reasonable that you give up a bit of the fit/feel/finish to get to the lower pricepoint. 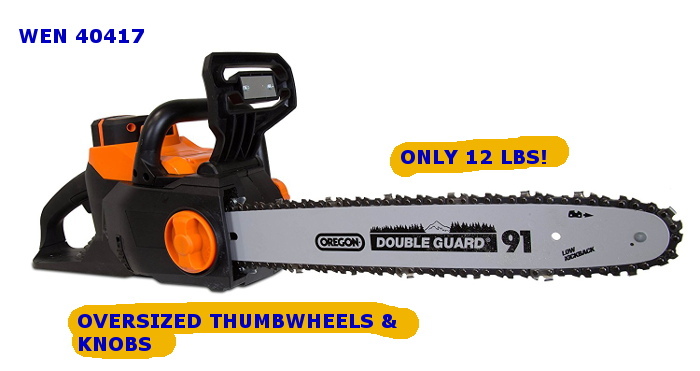 Both of these chainsaws utilize the low-kickback Oregon Double guard 91 bar. Since the WEN 40417 is longer, that means more bar and more chain, so it would be intuitive that it outweigh the Earthwise instead of the other way around. With no specs on either motor, and two batteries that don’t look substantially heavier than one another, we are left to only guess at what causes the weight difference. Neither of these chainsaws should be picked up by a pro lumberjack and toted off to work every day. They just aren’t made for that. Just by touch and feel, the WEN seems to me to be a big more focused on a lighter duty-cycle than the Earthwise product. The WEN’s handle design and chain guard is good, but doesn’t fit my hand quite as well as the Earthwise. WEN also has tool-less chain tensioning and automatic oiling. They claim tool-free blade changing, which the user can achieve by using a large knob instead of two bolts (like the Earthwise LCS358814). I can’t fault them for trying, as such a tool-free system is nice and convenient. But for the average Joe (or Jill), access to a few hand tools isn’t a big deal, and the chain won’t be replaced often enough to warranty making too big of a deal out of this feature. 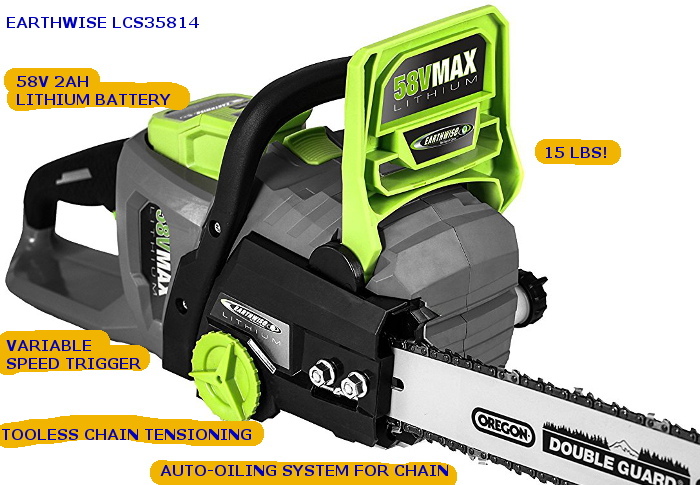 When making a decision between the WEN 40417 40V Max to the Earthwise LCS35814, we need to boil it down to what you intend on using the chainsaw for. The WEN is a good bit lighter, and has the convenience of tool-free chain changes. It’s also quite a lot cheaper, which is a big deal to some household budgets. I’d go so far as to say that if you won’t use your chainsaw all that often and intend to cut mostly softwood or hardwood that isn’t too large of diameter, you’d be fine in buying the WEN 40417. Basically, it’s cheaper and you probably don’t need to spend/waste money on a heavy-duty chainsaw. If you plan to use your chainsaw more often, and want a machine that’s probably more powerful, it’s worth paying extra for the Earthwise LCS35814. I don’t mean to sound like a broken record, but the warranty on the Earthwise tells me they intend for their product to take some abuse, and designed it that way. WEN’s 2-year warranty is good, but not good enough to win this chainsaw shootout. The Earthwise LCS35814 is a great saw, well worth its premium price tag.